Doesn't this just scream summer and make you happy just to look at it. DIY by Design created several vignettes using trays. I think they are such a great tool to use for decorating and she does it to perfection. Shelia @ Note Songs created this beautiful vignette. I love that she painted the chickenwire cloche white and showcases such a beautiful little bird inside. The nest and plant are perfect finishing touches. I love everything about this. 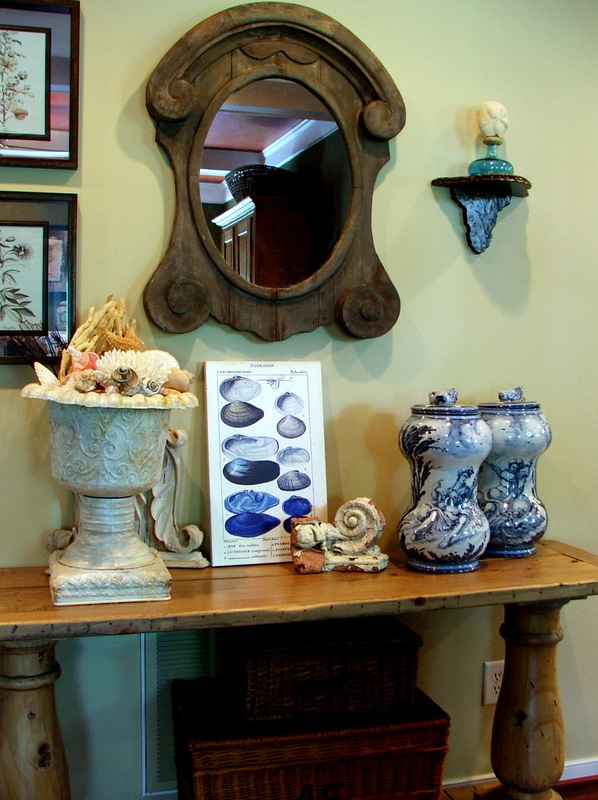 The table, mirror and the entire vignette. Gorgeous. You can always find something inspiring at No Minimalist Here. Summerland Cottage Studio created this fabulous vignette and she gives a tutorial for the fabulous rose planter that she made. She's also a fairly newby blogger and you really do want to visit and see more of her creativity. Wouldn't you love to be at this wonderful Garden Party setting created by Paint or Dig. Love this. My Domestic Bliss is so creative with her vignettes. Love the tablerunner, clock, frames, books and plant, then she tucks a cup and saucer in for an added twist and it is fabulous. Every week there are so many fabulous vignettes that it is hard to pick just a few. If you missed any of them, you really need to go back and take a look, they were all stunning. If you were featured, I would love for you to grab my button on the sidebar. I can't wait to see what all you have to show next week. Doesn't it just make you smile to see so many wonderful and creative women out there! Lovely features! Great features, Marty. I hope you have a wonderful weekend and mother's day. Thanks for sharing these wonderfully creative tablescapes. How inspiring! Happy Mother's Day! Thank you so much Marty for featuring me! I'm so honored! Have a wonderful Mother's Day! Marty, I enjoyed all the highlights...eacg is a "winner". I hope you have a great weekend and a lovely Mother's Day. They are all great and so much inspriration too! Marty, Thank you for visiting my home. Getting a thumbs from TTT is an honor. I always admire the things you can put together on a tabletop. You are so talented. Please come by to visit any time. I just got my cast off a couple of days ago. After I get the cleaning done, six weeks late, I will joining up again. Thanks for hosting. I would definitely love to have a party on this beautiful garden! Every detail is just fascinating. Look at that Statue vase! Isn't it wonderful with that plant on its head that seems to be its hair? OMGoodness Marty, what great features this week. Hope you have a wonderful Mother's Day. Very pretty. I love the Garden Party setting Paint or Dig showed from a Garden Show she went to. Lovely! Hi! Such a lovely place to stay! What a beautiful share today. I loved seeing all the contributions and the women's talents displayed. I love Sheila's little bird cloche painted white. It is perfect. Sure does pop with color. I love the vignette with the beautiful sunflowers on the tray. It sure does scream SUMMER. Believe it or not, and ready or not, I think it is here for us. So HOT already. We knew it was coming. I will have to visit some of the others you shared. Thank you for honoring each of them, it allows us the opportunity to visit some we might not otherwise meet. I want to copycat that Summerland Cottage Studio one! Hello ~it was such a pleasure catching up with you. I always enjoy seeing what you've got to share. We've got such delightfully talented sisters in blogland. They, like you, are so generous to bring such beauty into our lives. Thanks for sharing. Have a wonderful Mothers day Marty. Great features btw. Love that outdoor one with the green chair. Wow what a lovey post. So much talent!Happy Mothers Day! Big Hugs!! and crazy busy with work. I just discovered your Tuesday Highlights post and am so honored to be included.